MOSCOW, October 4. /TASS/. One battery of the air defense system S-300 will provide protection for the Russian Navy’s logistic facility in Tartus and Russian ships off Syria’s shores, Defense Ministry spokesman Igor Konashenkov told the media on Tuesday. 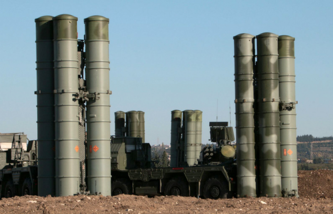 "It is true that one battery of the S-300 air defense systems has been delivered to Syria. It is to provide protection for the naval logistics facility in Tartus and the Russian Navy’s task force," Konashenkov said. He remarked it remained unclear why the decision to dispatch S-300 to Syria caused such commotion in the West. "Let me remind you that S-300 is an exceptionally defensive system and it poses no threat to anybody. Moreover, a ship-born equivalent of that system - called Fort was present in the region before. The Black Sea Fleet’s guided missile cruiser The Moskva is armed with it," Konashenkov said. Russia last year moved to Syria its newest air defense system S-400. As Russian President Vladimir Putin said in the middle of last March, S-400 systems and short-range systems Pantsir would remain on permanent combat duty in Syria. "It is the United States that has fallen through with a crash regarding the implementation of the September 9 ceasefire agreements. It failed to separate a single group of the so-called opposition from Jabhat al-Nusra (outlawed in Russia) thus letting the terrorists regroup themselves and replenish reserves." "Isn’t it the right moment for our US counterparts to recognize in public that the whole opposition in Syria they have reared all along and still keep under control are part and parcel of the same "umbrella brands" - Al-Qaeda and Jabhat Al-Nusra (both outlawed in Russia)?" Konashenkov said. He invited Earnest "to get down to earth from the sky." It is the United States’ "simulated struggle against the Islamic State that allowed that terrorist group, acting before the eyes of the world, to seize first the north of Iraq and then almost devour Syria." The Russian Defense Ministry has not yet heard an answer from the United States why that group - Jabhat al-Nusra - "has throughout the years enjoyed Washington’s incredible benevolence, or to be more precise, direct connivance." The real yardstick to measure Russia’s successes, Konashenkov said, is not highfalutin rhetoric but Syria’s realities: the hundreds of villages that have been restored to peace, the tens of thousands of square kilometers of land cleared of terrorists and the thousands of tonnes of humanitarian aid delivered to civilians.